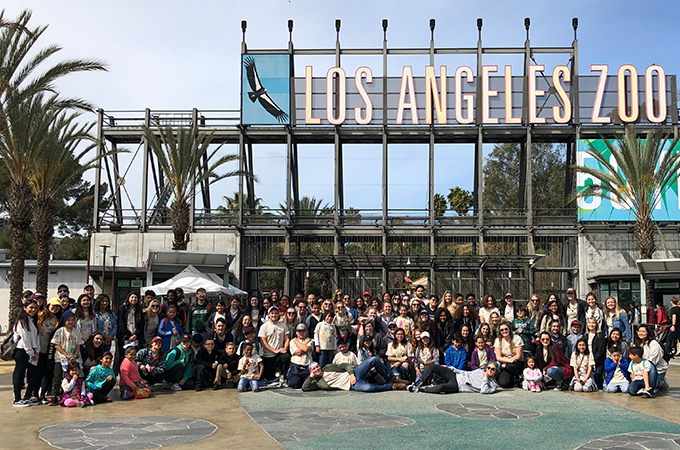 On Sunday, March 18, about 60 children and their University of Redlands mentors took a field trip from Big Buddies Redlands to the Los Angeles Zoo. The kids went wild a week earlier when we told them where we were going, and their attitudes were no different when we loaded up two buses to travel to L.A.
Big Buddies—a one-on-one mentorship program for elementary and middle school kids—meets for three hours every Monday evening for homework help, enrichment activities, and lots of fun. I was searching for a way to complete my community service requirement for the U of R when I discovered Big Buddies. I had experience coaching and tutoring young kids, so I decided to join the program at the beginning of my sophomore year. Unfortunately, I joined at a time when there weren’t enough kids in the program for every college student to have a buddy, so I spent several months helping where I could and standing in for absent mentors. But one Monday during the spring semester, I noticed a new girl working on math during homework help, and I thought maybe, just maybe, she would end up being my buddy—and she did! I was paired with Essence that evening, and we’ve been best buddies ever since. I had originally intended on leaving the program after completing my community service requirement, but when Essence asked me to continue on as her buddy in the fall, saying “no” didn’t even cross my mind. Although we have different favorite colors and disagree about whether pineapple belongs on pizza, Essence and I do agree that unicorns are awesome, boys are gross, and we have the coolest secret handshake. 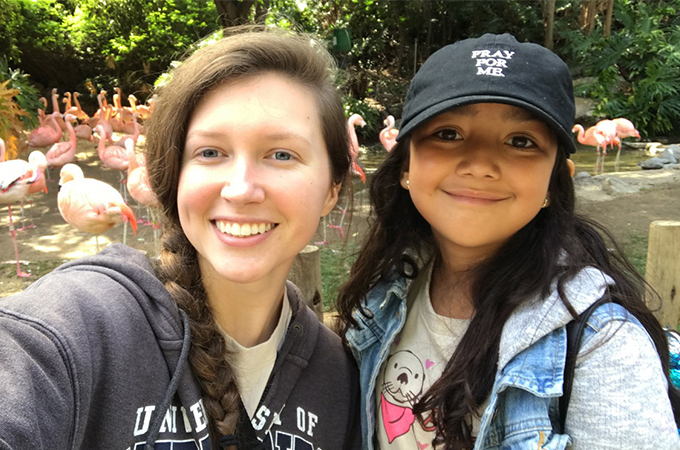 Taylor Matousek ’18 (left) and her little buddy, Essence, pose with the flamingos at the Los Angeles Zoo. Every year, Big Buddies raises money to take the entire program—children and U of R students—on a trip, free of charge. Essence and I have been on three field trips together: first Disneyland, then the California Science Center in L.A., and this time the L.A. Zoo. On this trip, after the children and mentors all posed for a group picture outside the zoo, it was off to the races, with mentors quite literally chasing after their buddies at times. 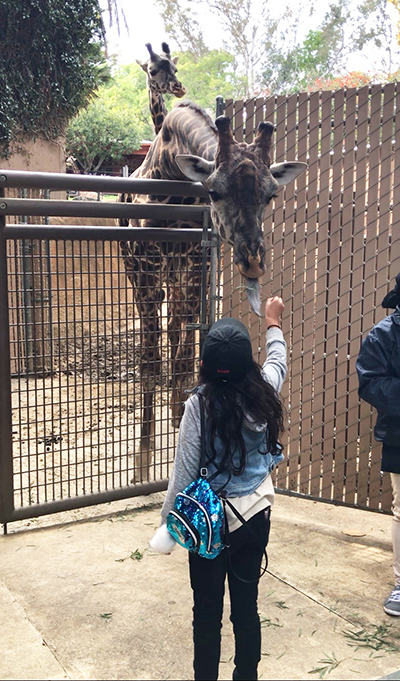 Essence, age 10, eagerly feeds a giraffe that took a while to find its appetite. Essence and I, with a couple of fellow program members, explored practically the entire zoo. Essence was ecstatic over the flamingos—which might’ve had something to do with her favorite color—and the mystery of why they stand on one leg (a Google search revealed that it takes practically no muscle energy for flamingos to stand in such a way—who knew?). I enjoyed the river otters and their surprisingly obnoxious squeals and enthusiasm over a plastic cup. When we grew tired in the afternoon, we fueled ourselves with cotton candy and soft-serve ice cream to push through the rest of the day. We walked a total of five miles, although I’m not sure how Essence managed it, considering she’s half my size. We certainly had a successful trip to the zoo, with only very mild sunburns. And, for the first time, I fell asleep on the ride home instead of her. The next evening during Big Buddies, I asked a few mentors and mentees about their favorite parts of the trip and I received diverse answers. Thank you to everyone who attended our fundraisers and donated in order to make our trip to the zoo possible. And thanks to the Big Buddies directors and Community Service Learning staff for working so hard to keep such an important program up and running. If you are a U of R student interested in joining Big Buddies, please email big_buddies@redlands.edu or stop by the Community Service Learning office on the second floor of Hunsaker.